There's nothing like a refreshing Fanta orange soda! So why not add it to a batter? If you are a fan of Fanta or orange frozen push-ups, you will very much enjoy the flavor of these cupcakes topped with a smooth orange-flavored icing to give it a wonderful orange taste in every bite. 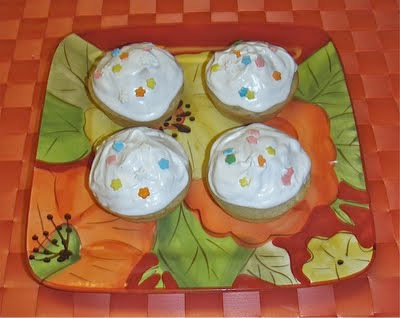 Very low point and totally yummy... these Fanta cupcakes are a real treat! Combine Splenda, eggs, and applesauce in a large mixing bowl. Add flour, baking powder, salt, and orange extract. Combine well. Pour in Fanta soda and mix well, scraping sides and bottom of bowl. Stir in grated orange rind. Pour batter into a cupcake tins sprayed with Pam cooking spray. Bake at 350 degrees for about 15 minutes (or until toothpick comes out clean when inserted into the middle). For frosting: Combine 1 tsp. of orange extract to some Betty Crocker Whipped Fluffy White icing and spread 1 to 2 tsp. on top of each cupcake. If you'd like a printer-friendly version of this recipe, Click Here.